How to have 60 people for dinner! It is 6pm and I have been up & working since 4:30am. But I am not tired, in fact, I am jazzed, pumped and ready for the joyful unknown that awaits us. Ruth is scurring from room to room to make sure every detail is ready for the evening. She is putting the finishing touches on table decorations, lighting candles, preparing the drink station and directing a host of volunteers who are here to help us. My kitchen helpers, Diana or Chewan or Janet are encouraging me and letting me know that they got my back. We are working on the appetizers and suddenly wish we had another 2 hours to prep & make ready! It is now 6:45 and the doorbell rings. Ruth or a volunteer answers the bell and welcomes 5 guests into our home, then another 5, then another 10, then 6 and it doesn't stop until 50 or 60 people have invaded ready for the time of their lives! Everyone is finishing up the meal and Ruth glides into the kitchen to dish the dessert with Rob and Josephus. While dessert is being dished, I get everyone's attention to begin the "Grub Interviews." Selecting a guest at random, I ask them to stand and we begin to find out a bit about them: where they were born, most memorable moments from childhood, favorite movie or favorite book. They are also asked for more "intimate" information: tell us about your first kiss; or besides your immediate family who has made the greatest impact on your life? And finally an "off-the-wall" question: if you could have any super power, which one would you choose? After two or three interviews dessert is ready to be served and all dig-in once again. After dessert is consumed (gobbled down, gulped and/or stuffed into our bellies) everyone is encouraged to pick-up their chairs their chairs and take them into the Gathering Room. Guests are seated and this is truly when the magic happens. This is the time when any or all are encouraged to to the stage and share a talent, a poem, a joke, a song or play an instrument. But before anyone begins, we lay the ground rules. We tell our guests that we adhere to the GK Chesterton philosophy of talent & performing: "If a thing is worth doing... it is worth doing badly!" Everyone laughs but that is not the end of his doctrine. 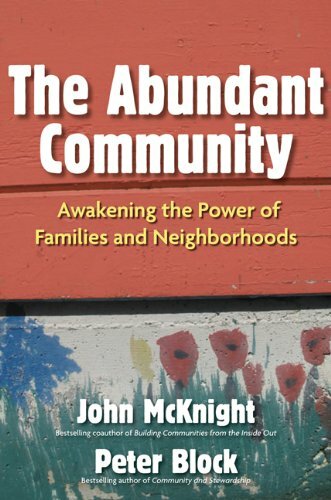 He goes on to say, "How many of us have banished singing, dancing, drawing painting from our lives for fear of not doing it well? If a thing is worth doing, it is worth doing for the joy of it!" So having the ground rule established, we are ready to warm to the glow of others sharing their hearts and souls. People who have only performed in front of mirror rise to give it their all. Seasoned professionals who sing or play an instrument for a living give gracefully of themselves. And no one is judged good or bad, weak or strong, professional or amatuer. We just bask in the depth of love for one another. It is magic. Before we know it, the evening has slipped away and we must go to our separate lives. But we hold the magic and the charm of that evening for a lifetime. 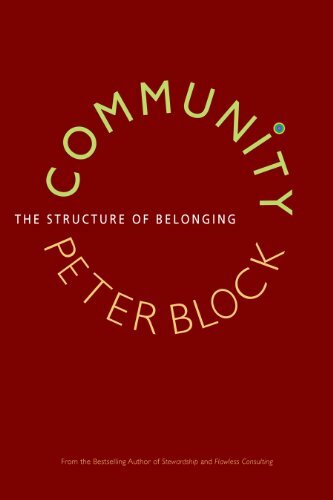 Much of the inspiration and information about community have come the books below. If you purchase thru us, it will not cost you more but we will get a small commision!